A unique collaboration between Waugh Thistleton Architects, the American Hardwood Council and arup has delivered Britain’s first large scale structure built from modular cross laminated timber. Built by the Construction Scotland Innovation Centre it is also a harbinger of bigger and better things to come. Peter Wilson, managing director of Timber Design Initiatives, tells us more. A year on from the opening of its factory facilities in the Hamilton International Business Park near Blantyre, the first really visible evidence of what the Scottish Construction Innovation Centre is there to do has hit the design community’s global headlines. Yes, the Centre has held numerous seminars and conferences at its premises in this generally less visited corner of Scotland, but for architects, engineers and other construction professionals as well as contractors and manufacturers around the country, awareness of its activities and purpose is still not widely enough recognised. Readers of the previous issue of Urban Realm have, of course, had the benefit of an introduction to the resources and support the Centre offers to those with innovative ideas likely to bring new business and employment opportunities to the industry in Scotland. For those less familiar, it does this by providing the hub that aims to link industry initiatives with the research, development and testing experience and skills within 13 of Scotland’s 19 universities (the other six have no involvement in construction) and is one of eight Innovation Centres covering different sectors that have been established by the Scottish Government to more closely focus academic knowledge and experience on new business opportunities that will add value to Scotland’s economy. With its open door to all parts of the country’s construction industry, the Centre is beginning to make its mark and, with its most recent large-scale involvement, extending awareness to the wider world of its capacity - and potential - to deliver transformational projects. 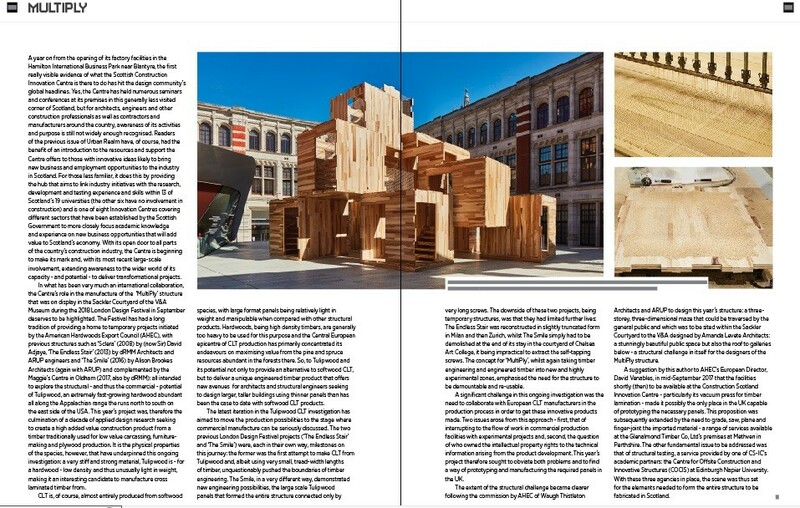 In what has been very much an international collaboration, the Centre’s role in the manufacture of the ‘MultiPly’ structure that was on display in the Sackler Courtyard of the V&A Museum during the 2018 London Design Festival in September deserves to be highlighted. 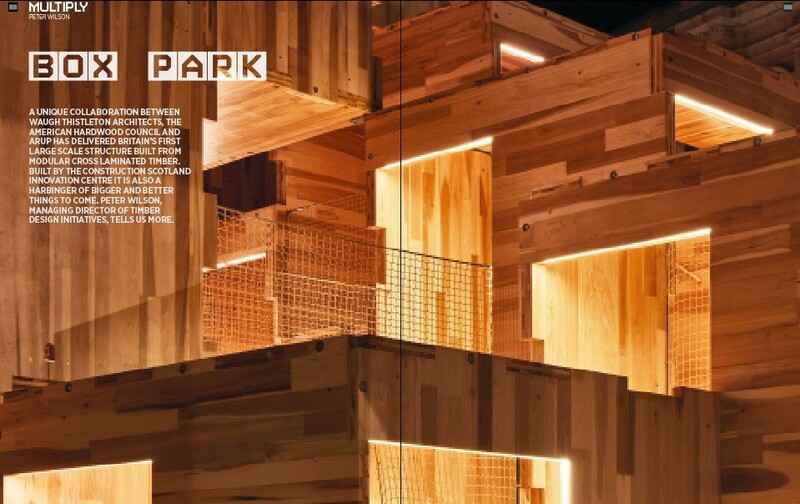 The Festival has had a long tradition of providing a home to temporary projects initiated by the American Hardwoods Export Council (AHEC), with previous structures such as ‘Sclera’ (2008) by (now Sir) David Adjaye, ‘The Endless Stair’ (2013) by dRMM Architects and ARUP engineers and ‘The Smile’ (2016) by Alison Brookes Architects (again with ARUP) and complemented by the Maggie’s Centre in Oldham (2017, also by dRMM): all intended to explore the structural - and thus the commercial - potential of Tulipwood, an extremely fast-growing hardwood abundant all along the Appalachian range the runs north to south on the east side of the USA. This year’s project was, therefore the culmination of a decade of applied design research seeking to create a high added value construction product from a timber traditionally used for low value carcassing, furniture-making and plywood production. 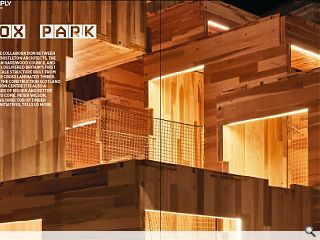 It is the physical properties of the species, however, that have underpinned this ongoing investigation: a very stiff and strong material, Tulipwood is - for a hardwood - low density and thus unusually light in weight, making it an interesting candidate to manufacture cross laminated timber from. CLT is, of course, almost entirely produced from softwood species, with large format panels being relatively light in weight and manipulable when compared with other structural products. 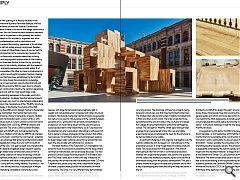 Hardwoods, being high density timbers, are generally too heavy to be used for this purpose and the Central European epicentre of CLT production has primarily concentrated its endeavours on maximising value from the pine and spruce resources abundant in the forests there. So, to Tulipwood and its potential not only to provide an alternative to softwood CLT, but to deliver a unique engineered timber product that offers new avenues for architects and structural engineers seeking to design larger, taller buildings using thinner panels than has been the case to date with softwood CLT products. 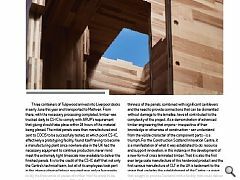 The latest iteration in the Tulipwood CLT investigation has aimed to move the production possibilities to the stage where commercial manufacture can be seriously discussed. The two previous London Design Festival projects (‘The Endless Stair’ and ‘The Smile’) were, each in their own way, milestones on this journey: the former was the first attempt to make CLT from Tulipwood and, albeit using very small, tread-width lengths of timber, unquestionably pushed the boundaries of timber engineering. The Smile, in a very different way, demonstrated new engineering possibilities, the large scale Tulipwood panels that formed the entire structure connected only by very long screws. The downside of these two projects, being temporary structures, was that they had limited further lives: The Endless Stair was reconstructed in slightly truncated form in Milan and then Zurich, whilst The Smile simply had to be demolished at the end of its stay in the courtyard of Chelsea Art College, it being impractical to extract the self-tapping screws. The concept for ‘MultiPly’, whilst again taking timber engineering and engineered timber into new and highly experimental zones, emphasised the need for the structure to be demountable and re-usable. A significant challenge in this ongoing investigation was the need to collaborate with European CLT manufacturers in the production process in order to get these innovative products made. Two issues arose from this approach - first, that of interrupting to the flow of work in commercial production facilities with experimental projects and, second, the question of who owned the intellectual property rights to the technical information arising from the product development. This year’s project therefore sought to obviate both problems and to find a way of prototyping and manufacturing the required panels in the UK. The extent of the structural challenge became clearer following the commission by AHEC of Waugh Thistleton Architects and ARUP to design this year’s structure: a three-storey, three-dimensional maze that could be traversed by the general public and which was to be sited within the Sackler Courtyard to the V&A designed by Amanda Levete Architects: a stunningly beautiful public space but also the roof to galleries below - a structural challenge in itself for the designers of the MultiPly structure. A suggestion by this author to AHEC’s European Director, David Venables, in mid-September 2017 that the facilities shortly (then) to be available at the Construction Scotland Innovation Centre - particularly its vacuum press for timber lamination - made it possibly the only place in the UK capable of prototyping the necessary panels. This proposition was subsequently extended by the need to grade, saw, plane and finger-joint the imported material - a range of services available at the Glenalmond Timber Co, Ltd’s premises at Methven in Perthshire. The other fundamental issue to be addressed was that of structural testing, a service provided by one of CS-IC’s academic partners: the Centre for Offsite Construction and Innovative Structures (COCIS) at Edinburgh Napier University. With these three agencies in place, the scene was thus set for the elements needed to form the entire structure to be fabricated in Scotland. Three containers of Tulipwood arrived into Liverpool docks in early June this year and transported to Methven. From there, with the necessary processing completed, timber was trucked daily to CS-IC to comply with ARUP’s requirement that gluing should take place within 24 hours of the material being planed. The initial panels were then manufactured and sent to COCIS to be successfully tested, at which point CS-IC, effectively a prototyping facility, found itself having to become a manufacturing plant since nowhere else in the UK had the necessary equipment to continue production, never mind meet the extremely tight timescale now available to deliver the finished panels. It is to the credit of the CS-IC staff that not only the Centre’s technical team, but all of its employees took part in the intense physical labour required over only a few weeks to lay the thousands of pieces of timber into the press to be glued into the lamellae of the 120 x 2.4m square panels required to form the 17 cubes of the MultiPly structure. Two types of panels were produced in this way: 100mm thick (five lamellae) structural panels and 60mm thick (three lamellae) non-structural panels. The finished panels were then transported to the Stage One company in Leeds for the final prefabrication of the cubes and their internal stairs and from there to London. The finished structure is both spectacular and popular. Andrew Lawrence, head of ARUP’s timber engineering division, is clear that what at first sight might appear to be a relatively unassuming assembly of boxes, is one of the most difficult engineering challenges he and his team have faced. The thinness of the panels, combined with significant cantilevers and the need to provide connections that can be dismantled without damage to the lamellae, have all contributed to the complexity of the project. As a demonstration of advanced timber engineering that anyone - irrespective of their knowledge or otherwise of construction - can understand from the visible character of the component parts - is a triumph, For the Construction Scotland Innovation Centre, it is a manifestation of what it was established to do: resource and support innovation, in this instance in the development of a new form of cross laminated timber. 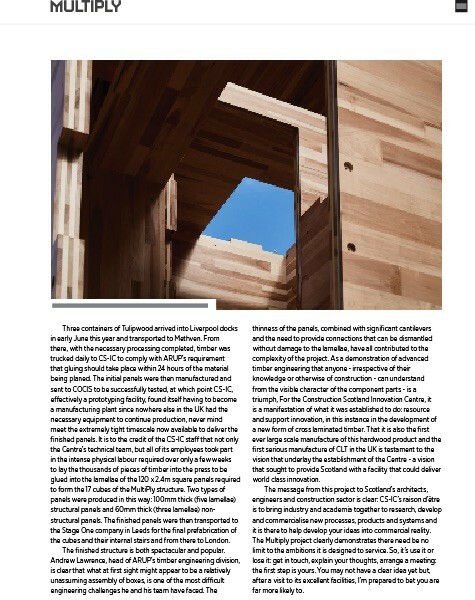 That it is also the first ever large scale manufacture of this hardwood product and the first serious manufacture of CLT in the UK is testament to the vision that underlay the establishment of the Centre - a vision that sought to provide Scotland with a facility that could deliver world class innovation. The message from this project to Scotland’s architects, engineers and construction sector is clear: CS-IC’s raison d’être is to bring industry and academia together to research, develop and commercialise new processes, products and systems and it is there to help develop your ideas into commercial reality. The Multiply project clearly demonstrates there need be no limit to the ambitions it is designed to service. So, it’s use it or lose it: get in touch, explain your thoughts, arrange a meeting: the first step is yours. You may not have a clear idea yet but, after a visit to its excellent facilities, I’m prepared to bet you are far more likely to.